As you will see, it is actually quite a simple Adobe Photoshop technique, but the results can be very effective! 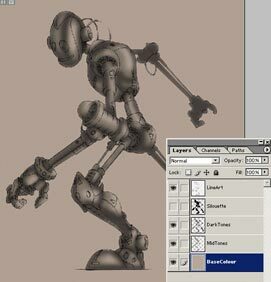 The workflow shown below is a good way to give an image the added dimension needed to convey shape and form. Remember this tutorial is designed for intermediate level Photoshop users, so I will not bog down the page with explanations on how to do every little function. If you are not very experienced in Photoshop, I suggest that you go through Melissa’s Colouring Line Art tutorial first. 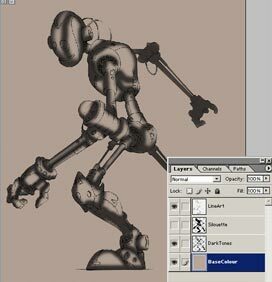 Scan your line art into Photoshop. Zoom right in and clean up any untidy areas. Finally desaturate and adjust the curves on your image to ensure that your lines are indeed black and the white is indeed white. This technique is explained in detail here. The image above is my line art once it was cleaned up. I named this layer “LineArt”. Next I created a new layer beneath the line art and gave it a nice tan colour. This just gives it a bit more life and be any colour you want. I changed the “Line Art” layer to multiply mode. This effectively renders the white of the “line art” layer transparent. 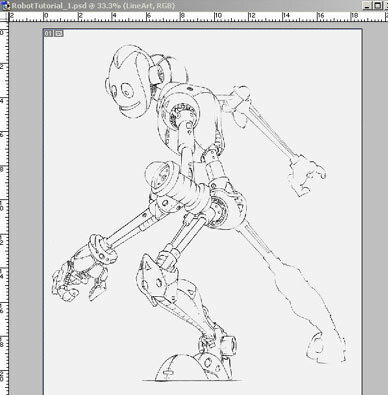 Now we can see the adjustments you make to the layers beneath without affecting the line art layer. I called this layer “BaseColour”. 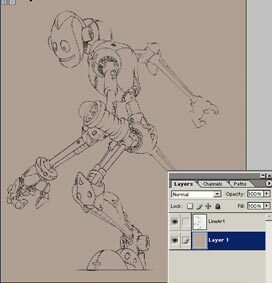 Next I create a new layer and filled in the shape of the robot with a solid colour, and named this layer “Silhouette”. This layer will not be visible, but serves a couple of purposes. 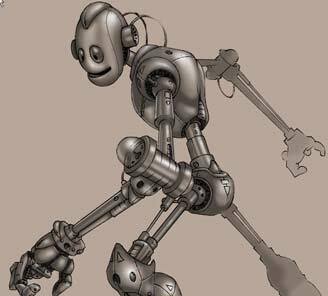 The first, is keeping the shaded values we are about to add within the lines. This enables a free and fast way to lay down the tones. The other purpose, is that eventually we will use this layer to form the shadow. 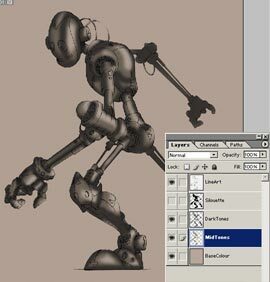 (Ctrl-click on the “Silhouette” layer in the “Layer Window” in old versions of Photoshop CS and earlier). With this area selected we won’t be able to draw over the lines. 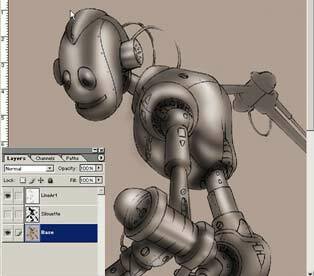 Next I create a new layer, and used a fairly dark colour to loosely lay in the darker areas of the robot. I named this layer “DarkTones”. I created another layer beneath the DarkTone layer. I used a slightly lighter shade to bring in some mid tones. No prizes for guessing what I called that layer. Again just lay it in loosely. I adjusted the transparency on both the DarkTone and MidTone layers and gave them a slight Gaussian blur. This blended the two shades together a bit more and lightened them up a bit. Once that was done I merged the two layers together with the brown base colour. I named this layer “Base”. I know it looks rough at this stage, but it does get better. Honest. I gave the “base” layer a bit more depth by using both the Dodge and Burn tools. You can start to tighten up while using this method. Make sure you use a blurred brush not a solid one, or else you won’t get that nice blended effect. This is how it looks once all the adjustments are done with the Dodge and Burn tools. 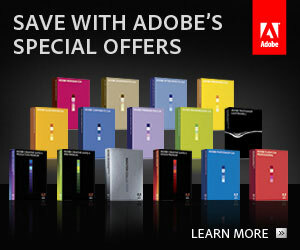 You can get that nice chrome, reflective look by alternating different values. An added visual aid is a bit of rim light added to certain areas. I placed it against a darker value to help make it stand out.